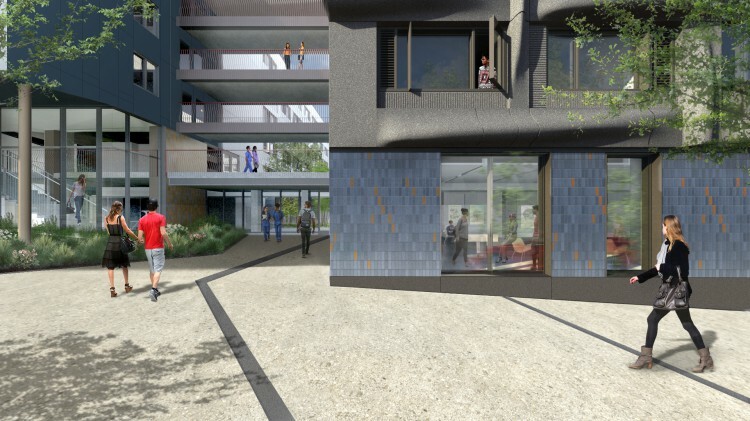 The new UC San Francisco student housing complex at 590 & 600 Minnesota Street has been officially named: UCSF Housing at the Tidelands. UCSF Chancellor Sam Hawgood and the Chancellor’s Cabinet approved the name in mid-August. The name was recommended by the university’s Minnesota Street Housing Naming Task Force, which solicited ideas from the UCSF community. “The Tidelands” will be used as short-hand. The name refers to the historic, pre-development name of the neighborhood, which was called the Saltwater Tidelands. “The name emphasizes the natural environment of this area,” said Todd McGregor, assistant director of Housing Services at UCSF. When the new complex opens in the summer of 2019, it will provide much-needed housing for 708 students and trainees. The two sites, both of which are about 40,000 square feet, will include 385 efficiency units, 95 studio apartments and 115 two-bedroom apartments. A community market will also be developed on the ground floor. All units will come with beds, desks, a dining area and induction stove tops and convection microwave ovens. They are located just one-block south of the UCSF Medical Center at Mission Bay and will be served by the university’s extensive shuttle system. Public bus and light rail options are also located nearby. To review term limits and learn about the application process, visit UCSF Housing.